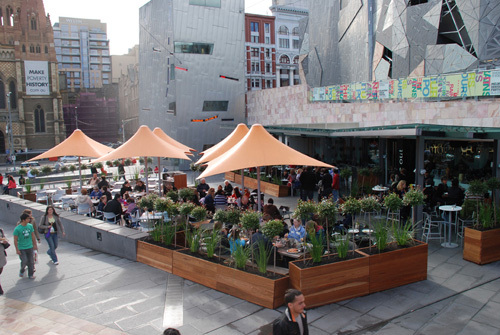 Federation Square in Melbourne had the primary goal to create a great place. If the primary goal of architects and landscape architects was to create places that people want to be in, would we be designing our communities the way we do today? If contemporary architecture was asked to be responsive to community outcomes, public uses and human comfort, would it be practiced differently? Would it create more demand for the skills of designers? Looking at our design magazines and our cities, it appears that the professional shaping of the built environment has been reduced to creating isolated physical forms with little consideration for their contribution to a larger experience of a place. This reality no doubt closely reflects a demand on design professionals to merely create designs (for buildings, parks, roads, master plans, etc.). Since they have rarely been asked to create places that attract people, it follows that they have not, for the most part, created such places. At a time when the skills, technology and need for creating successful places have never been greater, there are so few truly successful examples of new public spaces being created or improved. The design professions can be much better employed in shaping the public realm. The role of design can and should be much broader and bolder, but will undermine itself if it continues to try to drive a city building or Placemaking process the same way it does today. If the role of design is to create places, design actually becomes more valuable and creative while developing more productive relationships with the clients, partners and the communities it is serving. But if we merely focus on the goals of “good” or “world class” design as an end in itself, we limit the potential of what can be accomplished, and we ignore architecture’s ability to respond creatively to context. When a project prioritizes creating places that meet the needs of a its community, the design problems and solutions become more clear, interest in the project rises, and talented people step up to collaborate in the process. Our intention at Project for Public Spaces is to boost the prospects of success for urban designers, architects and landscape architects by creating public demand for quality urban spaces and educating communities to work creatively and constructively with design professionals. Ultimately, we want designers’ work to be more valued than it is today. PPS works to understand, bring about, celebrate, and inspire public spaces that are valuable to cities with the hope that we can get more of them. When public spaces do not get adequately used, do not add value to a community and do not become “owned” by the citizens that are meant to use them, it is not only a loss for the community, but it is a blow to the design professions whose contributions have been limited. By focusing on the broader goal of creating places, we are consistently able to draw more creativity out of the various professions, as well as the communities they serve. We believe that creating successful places should be much more easy and rewarding than it is today, and we dedicate ourselves to making that happen.